The Christmas season is here and I am loving it! Mostly because I made this Chocolate Roulade with Baileys Cream! 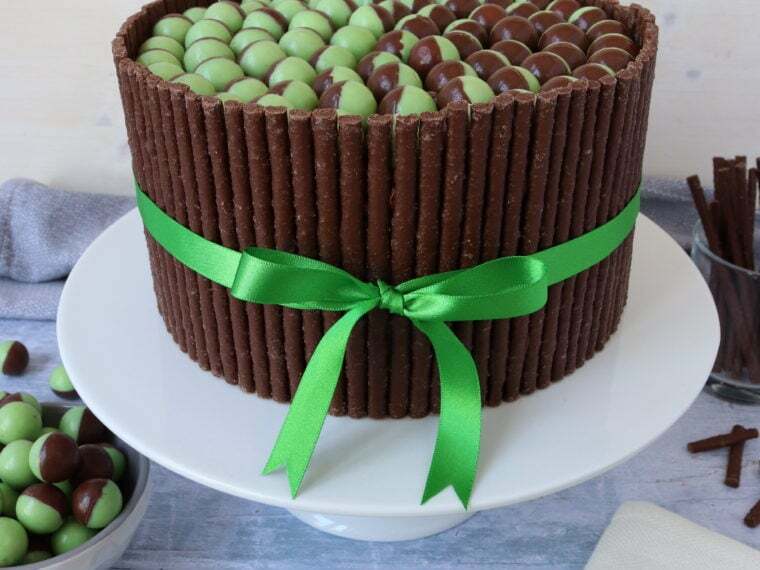 I saw the fabulous Mary Berry make this at the BBC Good Food Bakes & Cakes Show back in 2014 and the whole audience was drooling. Although her original recipe doesn’t feature any Baileys, at the show she put a good glug of it into the cream and I thought it sounded delicious. When I was invited over for dinner at a friend’s house I took this over for dessert, much to everyone’s delight! It’s also naturally gluten free, so it’s a fabulous dessert for your coeliac friends too! 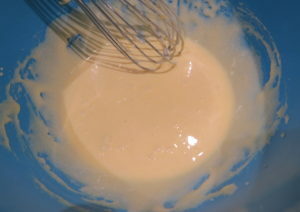 To start I whisked up the egg yolks and caster sugar until thick and creamy. 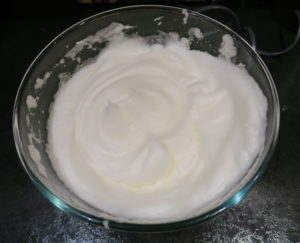 Then I whisked up the egg whites until stiff peaks formed. 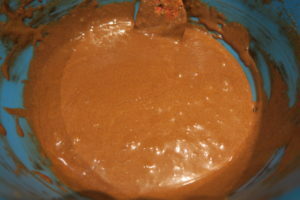 I added melted chocolate into the egg yolk mixture. Then I mixed in one tablespoon of the egg whites. 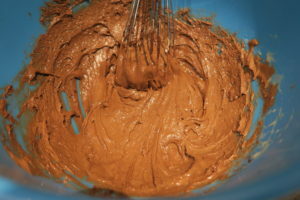 I folded in the rest of the egg whites gently, and then the cocoa powder. 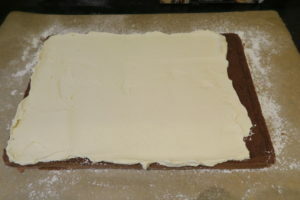 I poured the mixture into a lined baking tray. 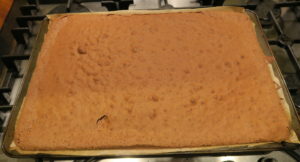 If you have a swiss roll tin you can use that, but I just used a regular baking tray. It baked for 20 minutes and I left it to cool in the tin. When it was completely cool I whipped up the double cream with icing sugar and Baileys. I tipped the sponge out onto a piece of baking paper dusted with icing sugar. 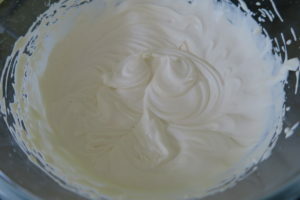 Then I spread the cream over it, leaving a little gap at the end. I gently rolled the sponge up. It will crack, this is meant to happen and also makes a nice effect! The Chocolate Roulade with Baileys Cream is so light and delicious, the sponge has a great fudgey texture and the hit of Baileys in the cream adds festive decadence. Pre-heat your oven to 160C Fan/180C/350F/Gas Mark 4, and line a swiss roll tin or large baking tray with a lip with baking paper. You can find more of my Swiss Roll recipes by clicking here! Or click here for more Christmas recipes! Your sponge looks so light and you've got the roll and hardly any cracking. Seriously impressed! Thanks Janice! It was seriously delicious! I love a chocolate roulade at Christmas and have a recipe which is very similar to this, so I know just how good it tastes. Just like yours, It's gluten free too!!! LOVE the Baileys addition! Perfect for gluten free diets! Can't go wrong with some Baileys in there as well! Nice shout Ros, Baileys is one of my favourite drinks!